The former Dundalk star is expected to feature for the club in the FA Cup this weekend. 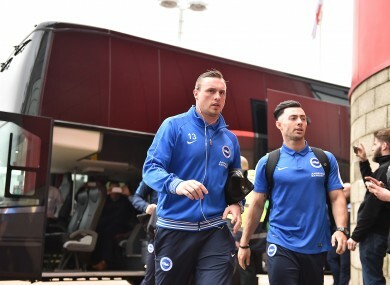 Richie Towell (right) has so far struggled for game time at Brighton. BRIGHTON BOSS CHRIS Hughton says that Richie Towell will be given a chance to impress at the club. Injury problems and competition for places means the former Dundalk star — whose 29 goals in the 2015 League of Ireland campaign earned him a move to the Seagulls — has made just two senior appearances for Brighton so far. The midfielder played in the 1-0 FA Cup loss to Hull almost exactly a year ago, while he was a second-half substitute in the 2-0 playoff loss to Sheffield Wednesday last May. This season, however, Towell has yet to play a minute of first-team action, but his manager insists he will be given a chance to impress. “It’s been difficult for Richie, because of the competition that he has for places in his position,” Hughton told RTÉ Sport. The former Ireland international, who has guided Brighton to the top of the Championship, added that Towell had a good chance of featuring for the club in the FA Cup this weekend. “We have an FA Cup tie against MK Dons on Saturday and we look forward to seeing him in that game,” he said. We were looking forward to the pre-season, to giving him a lot of games in the position we want him to play in and he got injured and missed a fair chunk of that period, which set him back a little bit. Listen to the full interview this Saturday from 2pm on RTÉ Radio 1′s Saturday Sport. Email “Richie Towell set to be given a chance to impress at Brighton”. Feedback on “Richie Towell set to be given a chance to impress at Brighton”.